I really love your stacked birds. They are the perfect take on the challenge. Ok, I think this is fabulous! Great crisp design. Love it! A definite winner! 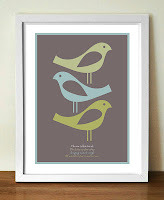 LOVE your take on this card jen ... the birdies are perfect, all with their own personalities ... that white sentiment rocks, so crisp. in other news we FLEW KITES, whoop whoop AND your package is SOMEWHERE in BERMUDA! Love this, Jen! I think you captured the trigger challenge perfectly. I will have to check this out sometime. Hope all is well in your little corner of the world! Ooh, this is a perfect take on the trigger. The artwork in those birds are amazing and they look so good stamped onto solid colored cardstock! Haha! Your little birdies made me smile! :-) Fantastic take on the trigger! LOVE your three little birds. Great job on the TT, Jen! How perfect is this for that trigger? What a wonderful card, Jen. Love it! Such a super cute birdie tower, and white embossing powder? With no accompanying story? YES! High five! Love, love, love those birdies...so cute Jen! great card Jen! i love how the birds become bigger guiding the eye to that cool white sentiment! Your is awesome, my friend - love it even more than the original (which totally tickles me). Amazing job of balance and color. You rock - for real! Just perfect, Jen! Love the look of the white embossing on gray. Spot on Jen! Love this take on the inspiration pic! Those little graphic birds are so cute! Ive seen some awesome takes on this trigger too and none of them are repeats so there must be enough birdies to go round!!! This is fantastic! I totally LOVE it and HOPE you were a winner! I noticed your name, but the wrong card as linked! :( Hopefully, it will be fixed soon! I knew it was a winner! Congrats on the shout out! Congrats on your TT. Great clean card. Love to see older stamps revived too! Great CAS take on the Trigger...congrats! Love your card so fun! Congrats on being a Trigger Target! That is a great card! Wow, I love your take! Well-deserved shout out over TT! I love it! Love this! The HA birds are adorable and the white embossing is perfectly done. Eeek, this couldn't be any more perfect! I love it. 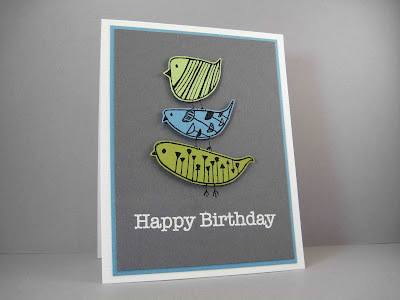 This stamp is totally perfect for this challenge and so is your card Jen! LoVe it! Your paper pieced birds are so cute! Super sweet card! Congrats on the Trigger Target award! perfect colors, perfect birdies and perfect embossing. LOVE! Congrats on the Trigger Target shout-out for your beautiful perfect card!